I was extremely privileged to be invited to my landlords (Ivan) traditional YuleFrokost event last night. These 20 or so guys have been meeting every year for 30 years. They even sit at exactly the same location around the table each year and sing the same songs. I was welcomed warmly and seated between Ivan and Hans (an old family friend of my aunt and uncle). I was mentioned in the speeches, and one of the jokes was specially translated to English for me. I believe Ivan's speech included something about me making a speach next in Danish but hopefully the Snaps was messing with my hearing. 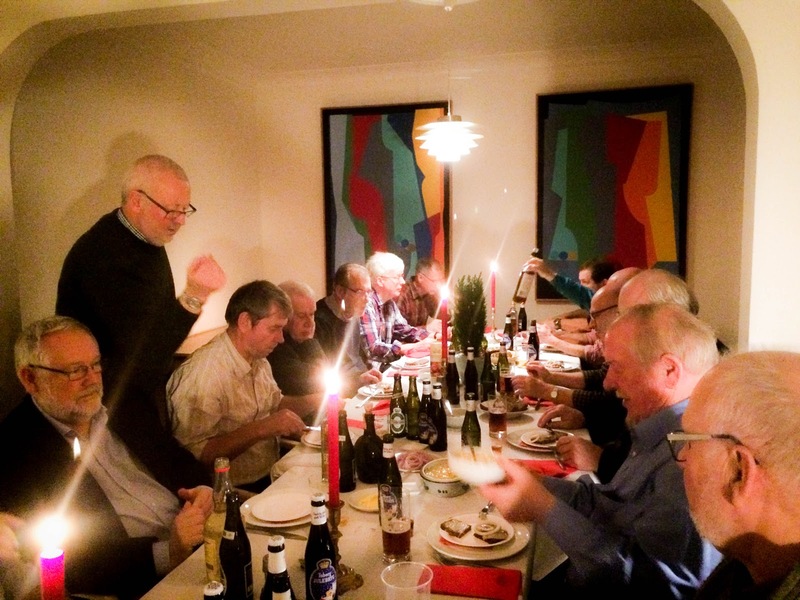 The food was all traditional, ribbensteg, grønkal, herring etc and the toasts many. I must have had 10 shots of snaps just in toasts. Anyway I practised a little danish and some spoke english with me. I felt very welcome, although some must have just been tolerating my presence in this hallowed gathering. I was one of the last to leave so helped tidy up then staggered through town to Greve axel. It had opened for the night club crowd for the last time. Nichlaus kindly gave me a free cone of fries to settle the munchies and then I was off to the irish pub to meet some friends for some cleansing ale. Needless to say I did not get out of bed the next day.